1,000 Facebook Likes Giveaway Winner Announced! - Polish Etc. 1,000 Facebook Likes Giveaway Winner Announced! So you may be wondering why you haven't seen any posts from me, and I do apologize for that. The fact is, like many bloggers, I've suddenly found myself incredibly busy! The fall is always the worst for me, and it's hard to imagine that just one year ago I was participating in the 31 Day Challenge (it was so hard to pass it up this year). Lately, my nails get painted about once a week, and the photos sit on my camera for even longer. Without the time to paint my nails I fear I have very little to share with you all! I'm doing my nails more often this week, so hopefully I will be able to edit photos and have some posts up for you ASAP! Until then, feel free to check out my Instagram feed (in the right sidebar) for current mani pictures! So thank you to all of my new followers, and thank you to everyone else for sticking with me! Without further ado, I'd like to announce the winners of my 1,000 Facebook likes giveaway! 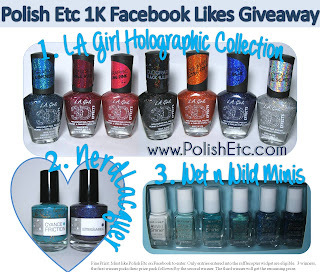 I had a lot of fun with this giveaway and it was great getting to see the manis you shared with me. The first winner is Bianca R. who gets first choice of the three prizes! The second winner is Beth C. who gets second choice! Finally, the winner of the remaining prize is Krystal K! Bianca has been emailed and she will have 48 hours to respond to my email and choose a prize. If I don't hear back from her in 48 hours, Beth will get first choice and a new winner will be chosen to receive the third prize. Congrats ladies, and thank you to everyone who entered! Business holders are cheap Facebook fans using the site for effective promotions of their products and services for reaching millions of users spread all over the globe.